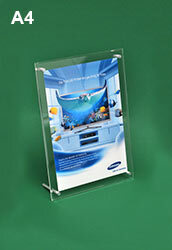 Clear Sign Holders Angle Upwards to Make Reading Signage Easier! 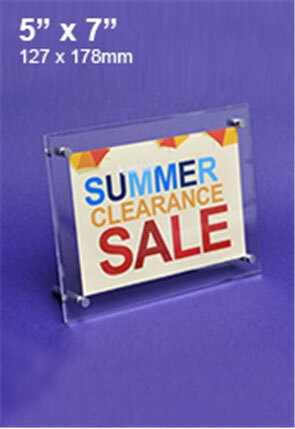 The clear sign holders have many sizes and styles to choose from to allow your business to find the right version that works best for your needs. 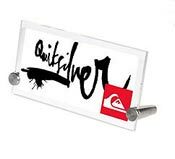 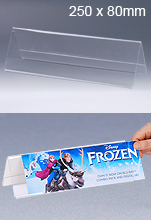 These acrylic table top sign holders may be used to place signage that shows pricing, describes goods, has product specs, denotes artist name, or to announce upcoming specials and ongoing events. 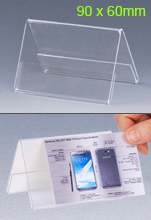 The plastic displays, clear sign holders make it easy to show graphics on your counter, table, or desk in a stylish manner with inexpensive products that have the visual allure of glass! 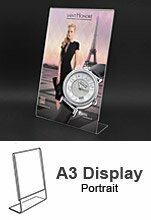 These acrylic table top sign holders may be used in many different locations effectively, including transit stations, retail stores, jewelry shops, art galleries, museums, cafes, restaurants, information centres, and more. 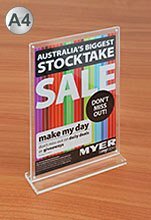 These counter signage displays utilise clear plastic to hold your graphics, making it easy to read displayed information and drawing in passersby with ease when placed in any location. 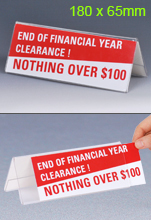 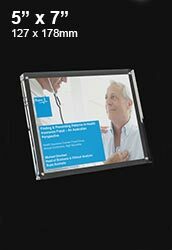 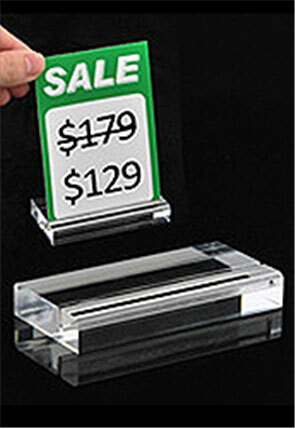 What types of clear sign holders are offered? 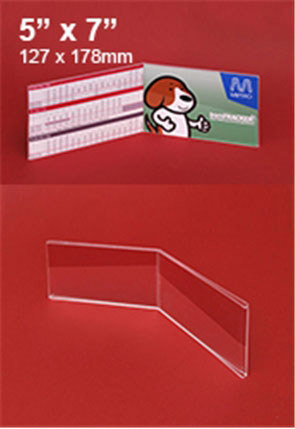 There are different types of plastic displays to choose from to help ensure that you may find one that works for your needs no matter what type of business you are or what you are trying to promote. 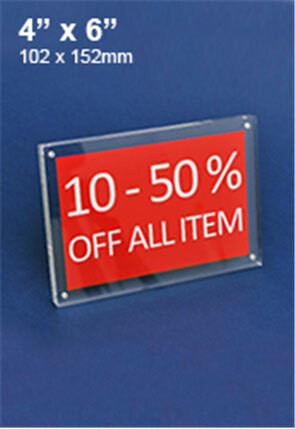 The different plexiglass tabletop counters include slanted POS displays that are designed to hold A3, A4, & A5 graphics that are in either portrait or landscape orientation depending on the specific holder. 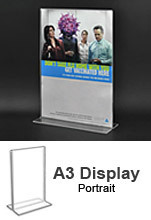 These displays hold a single sheet graphic, and switching your posters out is an easy task with no tools required and less than one minute needed. 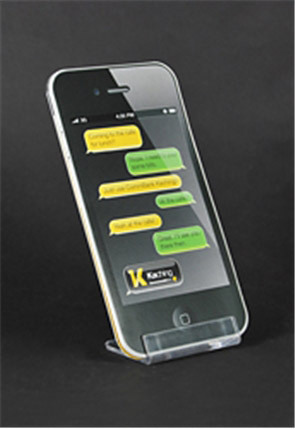 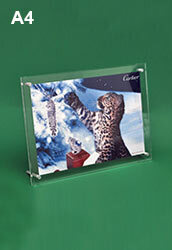 The slide-in design lets you easily slip graphics in between the bent acrylic! 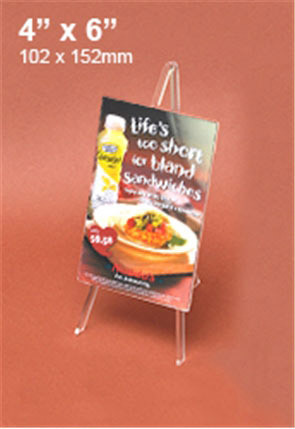 The slanted style makes it easier for passersby to read what is shown when these stands are placed on counters, desks, or tables! 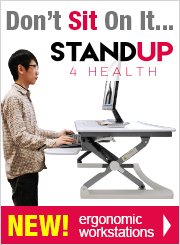 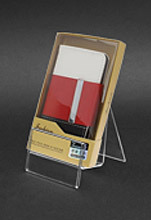 Different acrylic easels are also available for purchase, with adjustable back legs that make it easy to angle these stands at the right incline to be best seen by passersby wherever you place them. 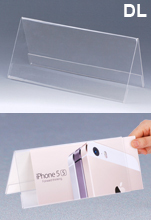 Using 2.5mm bent acrylic to create a slide-in frame, switching out posters is also an easy task on these stands. 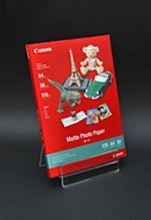 Different sizes of stands are used so you may find the right one for your needs, including standard photo sizes such as 3-1/2" x 5", 4" x 6", & 5" x 7"! 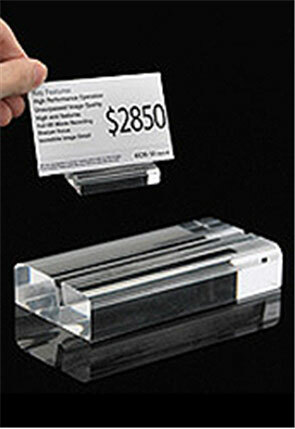 Plexiglass displays for counters included small risers that can be used to hold both merchandise & signage. 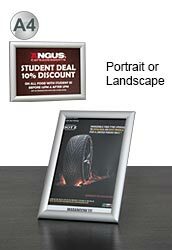 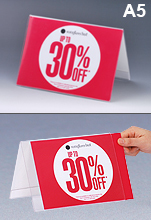 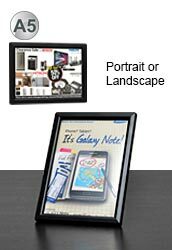 These displays are able to be placed onto any flat surface, and angle your signage upwards for best view by passersby. 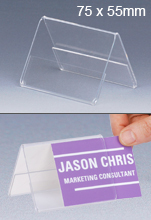 Using thick acrylic bases help to stabilise the stand to ensure that it doesn't fall over easily, holding your graphics in place to best be seen by visitors. 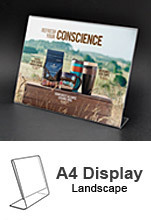 These displays are perfect for placement in heavily-trafficked areas such as cash wraps and sales counters for up-selling add-on items as customers get ready to pay! 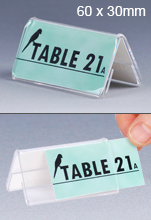 There are many tabletop plastic holders to choose from in this category, with the slanted block displays helping to create an attractive display that will make a favourable impression on clients. 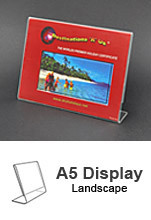 There are many standard-sized holders to choose from, including A4 & photo sizes 3-1/2" x 5" through 8" x 10"! 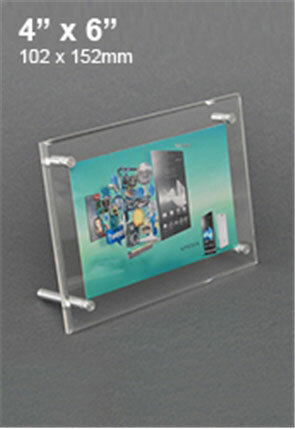 These holders have (2) thick acrylic panels that sandwich your pictures between for a floating effect that is stylish for use anywhere. 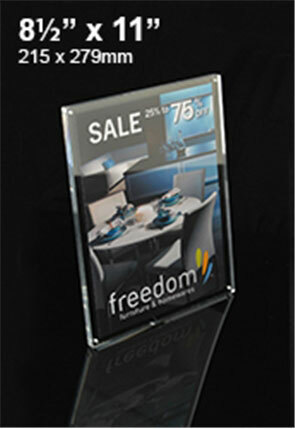 The edges of the panels are polished and chamfered in order to provide a professional look at any location. 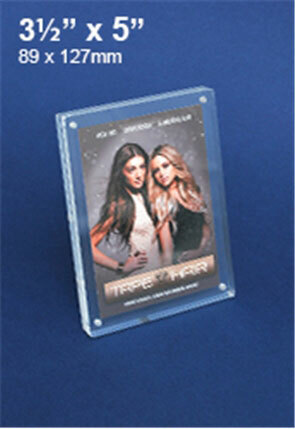 These holders have aluminium clasps and feet holding the two panels tightly together. 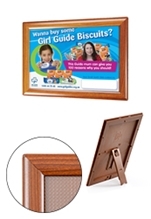 Switching out graphics is easy as well, simply unscrew the clasps and feet to access the interior of the frame and change out pictures! 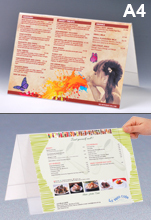 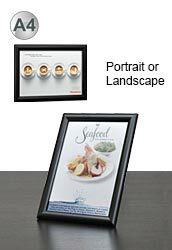 The menu displays also allow you to switch between landscape or portrait orientation with ease, simply switch where the clasps and feet are positioned! 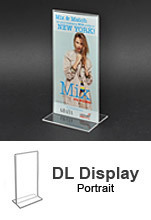 All of our displays utilise premium quality clear plastic that looks like glass, but is lighter, more durable, & less expensive to be easily available for any budget. 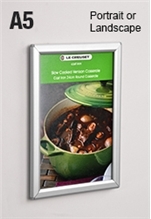 Edge-lit LED signs really make your graphics look spectacular, and with the versatility to be placed on a counter or wall, our options are perfect for your business. 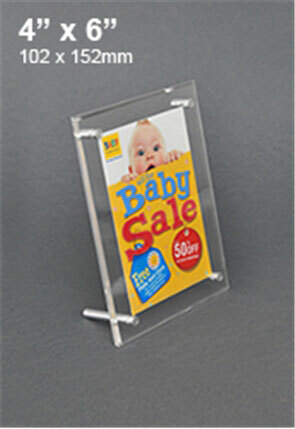 These plastic signage holders have a silver frame within the plexiglass that helps to draw the gaze of passersby towards the displayed graphic after their attention has already been caught by the concealed bright LEDs! 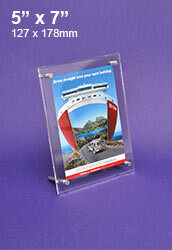 Some lightboxes require translucent graphics to be used in a frame like this, but the edge-lit design allows any image to be placed inside. 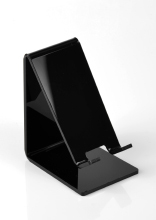 A 12v power cord is included that is 2110mm long, easily able to reach outlets in your business. 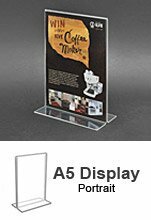 Tabletop displays include many different styles, making it easy to find the proper size & make that will work for your company. 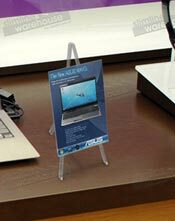 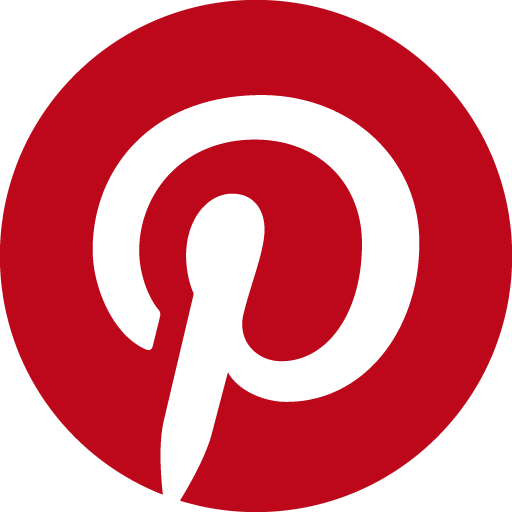 Whether for use in a restaurant, retail stores, or office, the various types of displays are available at inexpensive prices that will surely help your business to find the proper one for your needs. 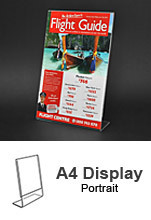 There are many types of poster stands to choose from to place around your business in order to inform visitors of information in a stylish manner. 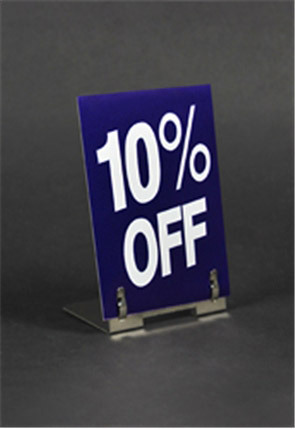 With both acrylic & aluminium items to choose from, in addition to POS sign stands and snapframes, it's easy to find the right style for use at your business. 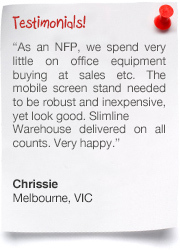 Browse through the massive online catalogue to see the hundreds of different products we are currently offering for you to outfit your business in style. 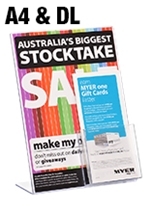 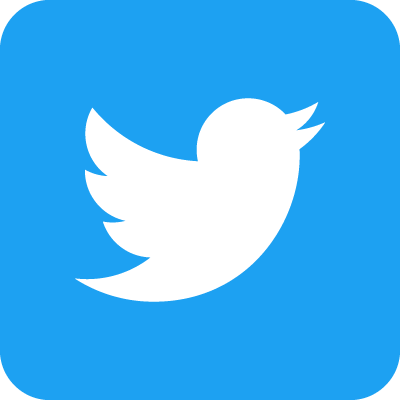 There are heaps to choose from in many categories, ensuring that finding the appropriate item to merchandise or promote at your business is an easy task. 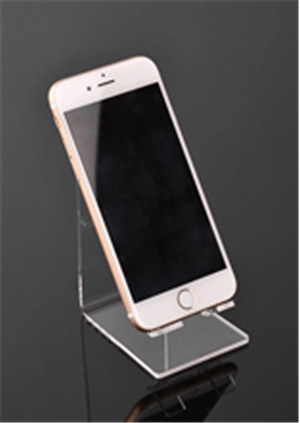 In order to stay current with the latest trends, styles, & technologies, new items are added practically weekly to help your company to keep ahead of the competition. 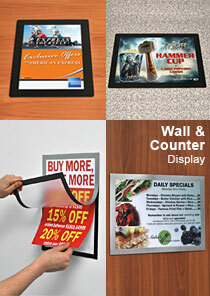 Check out the whole selection prior to check out in order to see all the notice boards, hanging hardware, window displays, stanchions, lecterns, cafe banners, stand offs, cigarette bins, event flags, sidewalk signs, poster stands, brochure holders, business card racks, pull up banners, and more that you can add onto your order! 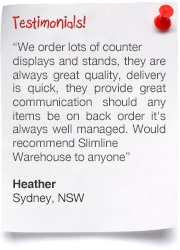 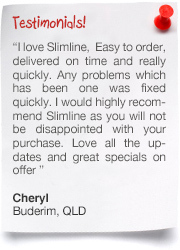 Slimline Warehouse has been providing high-quality goods at low prices to Australians for over 20 years. 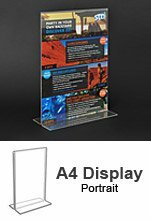 Our diverse selection of POP, POS, retail, & exhibition displays make it easy to find the right style that works for your business. 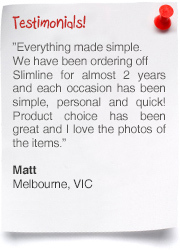 All our products are thoroughly tested to ensure only long-lasting items are offered to our customers, all made of high-quality materials & offered at low-prices not found anywhere else online. 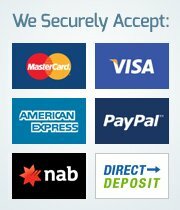 Purchases made prior to 1pm EST will despatch same day to anywhere in Australia from our warehouse with most in stock items. 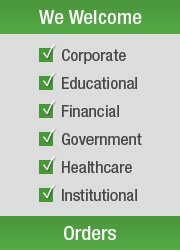 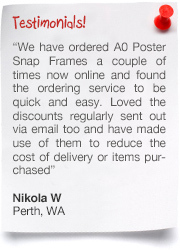 Order for your business today in Alice Springs, Adelaide, Bendigo, Toowoomba, Hobart, Melbourne, Canberra, Sydney, Newcastle, Gold Coast, Cairns, Noosa Heads, Brisbane, Darwin, or Perth!